Does this picture look familiar to you? Piles and piles of papers that seem to stretch to the ceiling? Any parent is used to collecting papers for their child, from report cards and permission slips to meeting reminders and art samples. But if you’re the parent of a child with a learning disability, then you’re responsible for dozens of other papers — doctor’s reports, test results, Evaluation Team Reports (ETRs), personal notes, and Individualized Education Plans (IEPs). With numerous meetings to attend and places to be, it can be difficult to ensure you have every required piece of paper on you at all times. Good news — there’s a simple solution! Amanda Morin from Understood.org has created a video that describes how to assemble and organize an IEP Binder for your child, thus ensuring you have all of the papers you need at all times. 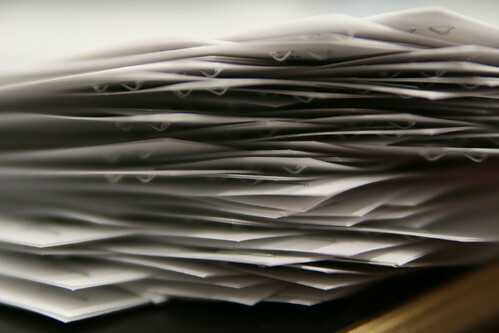 Imagine going to your child’s IEP meetings and not having to shuffle through a file of papers to find your child’s ETR. Well, now that dream can become a reality! To enhance your binder, Morin and Understood.com have included free resource downloads for your IEP binder, including a checklist, communications log, and goal tracker. Click here to download your free resources! The Special Education community does a tremendous job of banding together to help others in need. If you know someone else who would benefit from these free resources, I hope you will send them this blog post. Together we can make school a terrific place for our children!